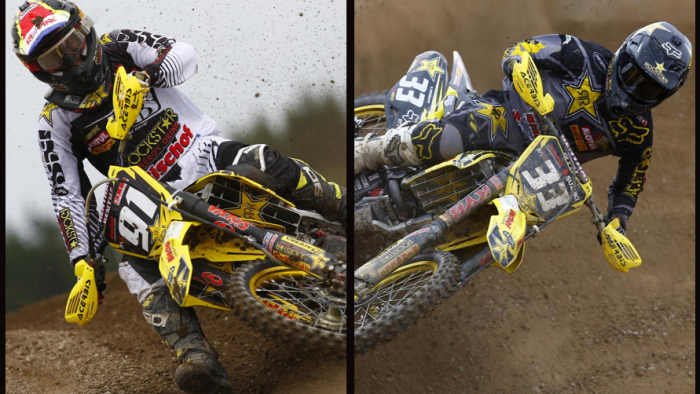 Team Suzuki Press Office – July 6. The Grand Prix of Sweden at Uddevalla was populated by 21,000 fans for the 12th round of the FIM Motocross World Championship and Rockstar Energy Suzuki Europe’s Jeremy Seewer led the line in the MX2 class with the works RM-Z250 by scoring 10th position overall. Team-mate Julien Lieber ploughed through the slippery and hard-pack surface to take 11th in the final GP classification and equal a career-best moto result with sixth spot in the first MX2 race. Uddevalla benefited from an overhaul to the racing layout – it was run in reverse compared to recent editions of the Grand Prix at the popular site – but the changes were still formed from the same unusual dirt that mean rutty sections of the track but also smooth, flat and slick areas. The tight flow of Uddevalla was again tricky for passing. Seewer started the weekend in fine fashion with an excellent start and second position in the formative laps of the qualification heat on Saturday. The Swiss ran wide which caused him to lose positions but his fifth place still equalled a personal best in Grand Prix. On Sunday he was closing up to his team-mate in the first moto for sixth but a slip dropped him down to 10th. Seewer banished the mistakes from the second moto and did a fine job to close the weekend by classifying ninth. Lieber’s sixth spot equalled a personal career-best; achieved in Spain this year and also Holland last season. It came as the result of a fine start and then steady application of pace to remain ahead of Christophe Charlier. The Belgian could not replicate the form in the second moto largely due to three separate falls that constantly required a bout of ‘catch up’. After the drama of hitting the dirt Lieber scrambled to 15th by the finish line. Seewer’s efforts mean that he keeps steady in 10th position in the MX2 World Championship standings while Lieber is 13th. No rest for Rockstar Energy Suzuki Europe with the Grand Prix of Finland at Hyvinkaa meaning a trip across northern Europe in the coming days. The second meeting in a week will precede the fourth round of the ADAC MX Masters German Championship at Tenfeld and then the team keeps on the road with the Czech Grand Prix at Loket completing a busy July.